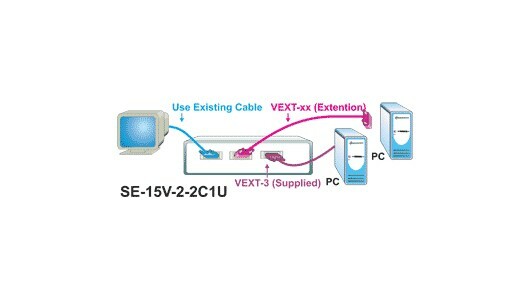 This VGA switch enables one VGA monitor to be switched between two computers. Compatible with PCs, SUNs, and MACs with VGA video. Both inputs are terminated in 75 ohms. Input and output connectors located on rear panel. Two male 15 pin HD input connectors. One female 15 pin HD output connector. The output can drive a standard 75 ohm load.